Low in fat and an excellent source of protein, Crawfish Etouffee, is a popular Louisiana crawfish recipe served over rice. 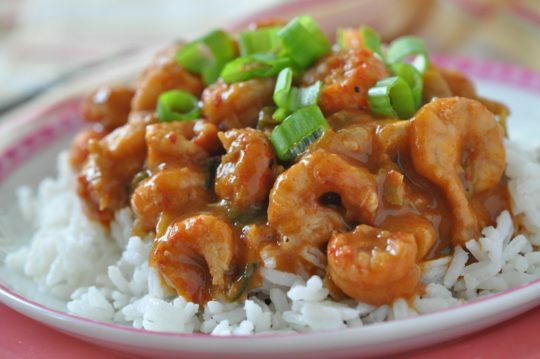 Etouffee means ‘smothered” onion, green pepper and garlic in a light roux making the most scrumptious sauce. Here’s my easy-to-follow, healthier recipe for this Louisiana favorite! This recipe is from Holly Clegg’s trim&TERRIFIC Gulf Coast Favorites cookbook. In large nonstick skillet coated with nonstick cooking spray, melt butter and stir in flour. Cook over medium heat until light brown, about 6–8 minutes, stirring con¬stantly. Add onion, green pepper, and garlic. Sauté until tender, about 5 minutes. Gradually add broth and stir until thickened. Add paprika and crawfish. Bring to a boil, reduce heat, cover, and cook for about 15 minutes, stirring occasionally. Season to taste. Stir in green onions and cook for another few minutes before serving. Terrific Tip: The browned flour and oil/butter creates a roux that gives the etouffee a deep rich flavor. Look for Louisiana crawfish in the freezer section of your grocery; and always check to make sure it’s Louisiana crawfish which is rated by the Monterey Bay Aquarium Seafood Watch as a “best choice” #1 rating. Recipe from Holly Clegg’s trim&TERRIFIC Gulf Coast Favorites. Visit Holly’s YouTube channel and website or blog for more recipes and tips.